More Than Just Olympic Sports! Winter offers snow-shoeing, sleighing and snow-boarding among other pursuits. Summer specialties include biking, hiking, fishing, eco-tours and kayaking. The city is a destination for foodies, as well. The New York Times ranks local restaurant prices as ridiculously low. The Globe and Mail reports that “…the city is so obsessed with haute cuisine they spend more money eating out than any other city in Canada.” What are you waiting for? Find out how and where to go today. Vancouver is indeed the jewel of Western Canada and it’s easy to see why the Olympic committee chose to honor this lovely city. Here is an outstanding metropolis, full of cosmopolitan restaurants, intriguing historical sites, fascinating museums and galleries. The history of the Pacific Northwest is unique and varied. You will spend countless hours immersed in the various cultures that made the area so prosperous and vibrant. River allowing bald eagle viewing are available to visitors through Lotus Land Tours. Rainforest hiking tours, accompanied by a trained naturalist, can be enjoyed in the North Shore Rainforest from Rockwood Adventures. Paragliding, canoeing, beach combing and sledding are available in season in the area. History buffs can find First Nation guided full-moon paddles in traditional canoes from the Tsleil-Waututh Nation. Be prepared to be amazed at the natural wonders of this unique geological Canadian province. Walkabout Historic Vancouver offers two hour walking tours through historic neighborhoods led by guides dressed as 19th century schoolmarms. Take a leisurely stroll through town and stop for a quiet meal at one of the city’s restored areas/neighborhoods, including Granville Island, Robson Street, West End, Gastown, or Kitsilano Beach. Or how about an evening dinner cruise on the waters around Vancouver, with a chance to taste fine food and bask in the beauty of the city as the sun sets over the coastal mountains? If you prefer to spend your hours outdoors lying on the beach there are many to choose from. English Bay Beach is famous for sunsets. Kitsilano Beach has a heated ocean pool for soaking away the tensions of travel and leisure. No matter where you travel in British Columbia, you’re sure to be greeted with a warm and welcoming smile and even a hearty handshake from residents and business owners who are genuinely glad to count you among the visitors to this pretty city. You’ll feel at home as you roam their museums, shop in their stores, and eat in their restaurants. If you’ve come here to enjoy the city’s arts and cultures, you won’t be disappointed. You can wander through walls full of fine art, hear the symphony orchestra, enjoy the ballet, and even see Shakespeare performed in an outdoor theater. While Vancouver BC is an outdoors-oriented city, the indoors holds treasure galore for the curious of all ages. Museums such as the Maritime Museum, H.R.MacMillan Space Center and the Museum of Anthropology are sure to fill any rainy day needs for distraction and edification of the whole family. There is bound to be an exhibit to interest all ages and attention spans inside the doors of these fabulous buildings. The Storyeum is just that: a place for stories about the people, history and music. Underground theaters contain a series of vignettes to explain the local history from First Nations origins up until the present. The music theater presentation is optimistic and engaging but does not ignore the problems associated with years of white settlement. If you like hockey, baseball, and the excitement of Canadian football, you can find every one of those here. But if you’d rather play than watch, try your hand at a number of watersports available in and around the waters of Vancouver, including sea kayaking, whitewater rafting, and scuba diving. Golf aficionados can play on some of the finest courses in Canada and hikers, bikers, and roller bladers will find plenty of places to explore. Thanks to its moderate climate, guests can visit Vancouver just about any time of the year. You’ll never swelter in the sun here, as the summer daytime temperatures average a comfortable 21 degrees Celsius (70 degrees Fahrenheit), making it the perfect time for outdoor pursuits or sightseeing. The fall is also a wonderful time to visit. Accommodation rates are lower and the theater, opera, and symphony are ushering in a new year of fine productions. If you visit in the spring, you may even be able to ski and golf on the very same day! Spring is also the busiest time for festivals and other special events and you’ll find that the gardens here are incredibly beautiful. Of course, if you’re a ski bum, you’ll want to come to Vancouver British Columbia during the winter. You’ll love Whistler and Blackcomb Ski Resorts, voted #3 among North America’s Top Ski Resorts by Ski Magazine (2005). Winter, spring, summer, fall…no matter when you visit, you’ll find the city of Vancouver to be a warm and welcoming place, greeting you with a fond embrace and encouraging you to return again and again to explore this wonderful vacation destination. "Visiting Vancouver is SO much fun. I just love all the things to see and do!" 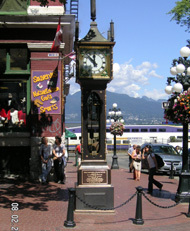 A stimulating, easy-to-read guide to Downtown Vancouver BC Canada. There is something for everyone. We explore the possibilities. Home to the Vancouver Lookout, the Harbour Centre Tower is a great place to enjoy a bird's-eye view of the city. Ascend 177 metres (581 feet) into Vancovuer's blue sky. You'll thrill at the view. There’s a myriad of activities to keep you busy at the picturesque Vancouver harbour. Sparkling waters, downtown high-rises, majical air, and bustling streets make the Vnacouver harbour a must-see. A stimulating, easy-to-read guide to Gastown, Vancouver BC Canada. Called the "Birthplace of Vancouver" it's the fascinating center of heritage buildings. A stimulating, easy-to-read guide to Chinatown, Vancouver BC Canada. The sight, sounds, and smells of Vancouver Chinatown will delight your senses. The Vancouver Province: News, jobs, sports, Canucks hockey, finance, rentals, arts, classifieds, obituaries. The paper for the busy person. Quick and easy news on-the-go. Reading the Vancouver Sun is a great way to learn about what’s going on in the city, including the Vancouver Sun Run. Vancouver harbour cruises and harbor tours offer the stress-free way to view stunning Vanvouver city. Enjoy daytime and luncheon cruises, dinner and sunset cruises, cocktail and starlight cruises. A descriptive guide to exciting Alaska Cruises. Make an Alaskan cruise one of the tours you'll never forget! Blast off at the state-of-the-art Vancouver Planetarium and thrilling Space Centre shows. Get a 360 degree view of the Vanvouver night sky. Vancouver's Storyeum - the fascinating story of British Columbia's history presented live in a unique series of underground stages. Vancouver’s Museum of Anthropology at the University of British Columbia offers visitors a glimpse at cultural objects from around the world. An easy-to-read guide to UBC, the University of British Columbia, Vancouver Canada. The exceptional institute of higher learning. A stimulating, easy-to-read guide to Granville Island, Vancouver BC Canada, one of the liveliest of Vanvouver attractions. Vancouver theatre provides dozens of opportunities for theater aficianados to experience the arts in this cultural city. Queen Elizabeth Park, Vancouver BC Canada. Beautiful gardens for weddings and picnics.Two former stone quarries have been developed into beautiful ornamental gardens. Come to Stanley Park in Vancouver BC Canada, one of the finest natural parks on the continent. You can jog, swim, golf, play tennis or checkers, lawn bowl, or go bicycling. A picture guide to Kitsilano Beach, Vancouver BC Canada. This city beach is a favourite attraction for both locals and visitors. 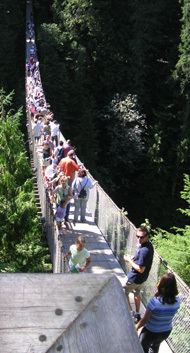 A stimulating, easy-to-read guide to the Capilano Suspension Bridge and Park, Vancouver BC Canada. You'll thrill to this Amazing Rainforest Adventure. An easy-to-read guide to Grouse Mountain, Vancouver BC Canada. Thrill to the Super Sky Ride and mountain skiing just minutes from downtown Vancouver. A stimulating, easy -to-read guide to Whistler Blackcomb, Vancouver BC Canada, Skiing, mountain biking, horseback riding, golf, dining, nightlife, even bungee jumping. Whistler has it all. There's accommodations for all budgets in Vancouver, Whistler and surrounding districts. Looking for a work from home job? We show ways you can work from home to build a business in these tough times.